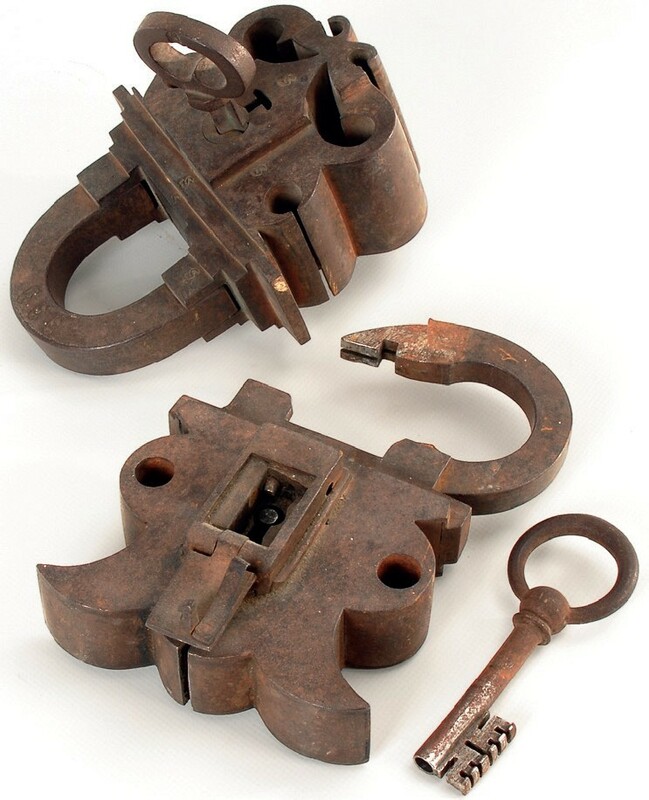 Two padlocks that sold at Wendl on February 28 for €3000 (£2610) apiece. They had both been consigned by an aristocratic family in Franconia, were described as possibly 16th century, and were probably intended for use on a castle or town gate. The first was stamped in several places with the letter S under a Greek cross and was 7in (17cm) high. It came with its original key and was in good working order. The bidding started at €240 and in next to no time the successful buyer closed the proceedings at €3000 (£2610). The following lot was somewhat smaller and could be dated to the same period. It had the added attraction of a metal plate covering the keyhole, a so-called Vexierplatte, an extra mechanism which had to be released before the keyhole could be accessed. It too came with its original key and even though the mechanism was somewhat stiff, the bids also went to €3000 (£2610). Both lots went to an Italian collector.